You know, I never understood the appeal of coffee until I went to college. As a freshman with 8am classes every morning, I was always out the door by 7:30am. I walked the mile-long walk to class from my dorm in the hot Arizona sun every. single. day. I’d walk through the center of campus, which had the bookstore, food court, and coffee shops. I’d usually stop in a convenience store to get water or a snack. After a couple months of school, insomnia started to kick in. I was super stressed, didn’t want to be in school in the first place, yet was taking on a full-time course load with math and science classes — the bane of my existence, but also the prerequisites for all the nutrition courses. I was across the country from my family and friends, didn’t go out and socialize like normal college kids, was struggling with severe depression, and on top of that, had a terrible roommate. After a few weeks of barely any sleep, I was exhausted. I needed caffeine. I tried energy drinks first because they’re sweet and bubbly like soda, but hated the fact that they were packed with sugar and weird chemicals. Damn, it was goooooood. How did I wait this long to try coffee?? For the record, I was (and still am) an absolute psycho with my coffee add-ins. I like it SWEET, SWEET, SWEET. Coffee is just so bitter, I need a bunch of sweetener and milk to drink. I used to use 9 Splenda packets for a large cup of coffee, plus about a cup or more of whole milk. I’ve gotten a lot better (aka, I use 6 packets of Truvia and about a cup of unsweetened vanilla almond milk or cashew milk). I made this dessert because I may or may not have bought a bulk pack of 12 natural, sugar free milk chocolate bars at Whole Foods (hey, don’t judge). To prevent myself from eating the entire 12-packet, I needed use some bars in a dessert. Krispy Treats came to my mind. And, naturally, so did chocolate. And then coffee. 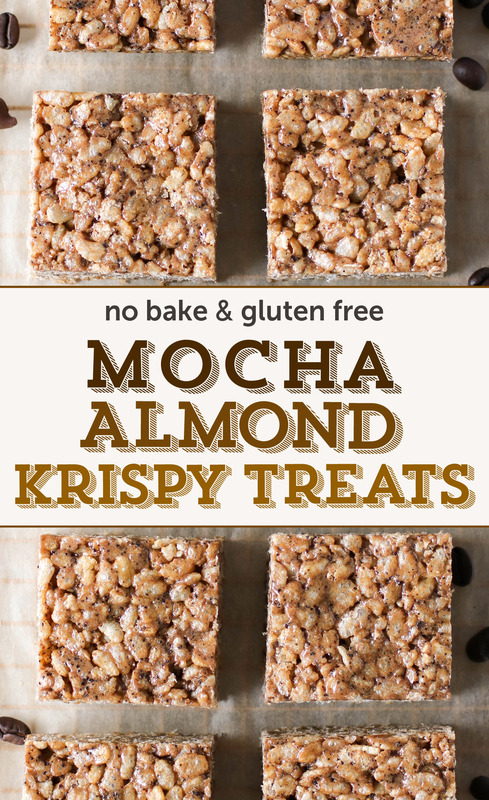 Mocha Almond Krispy Treats it is! And oh so delicious they were — soft, crunchy, and chewy, decadent and satisfying, and totally healthy and guilt free! 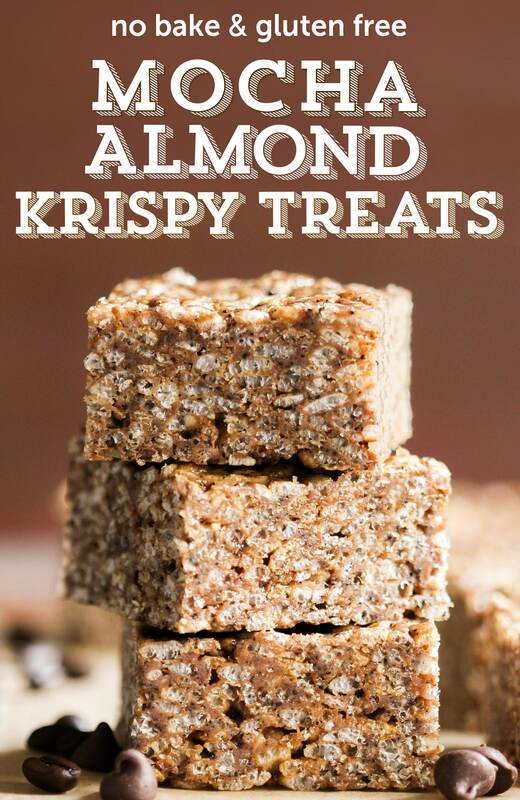 These Mocha Almond Krispy Treats are crunchy, chewy, decadent, and satisfying. You'd never know they're totally healthy and guilt free! 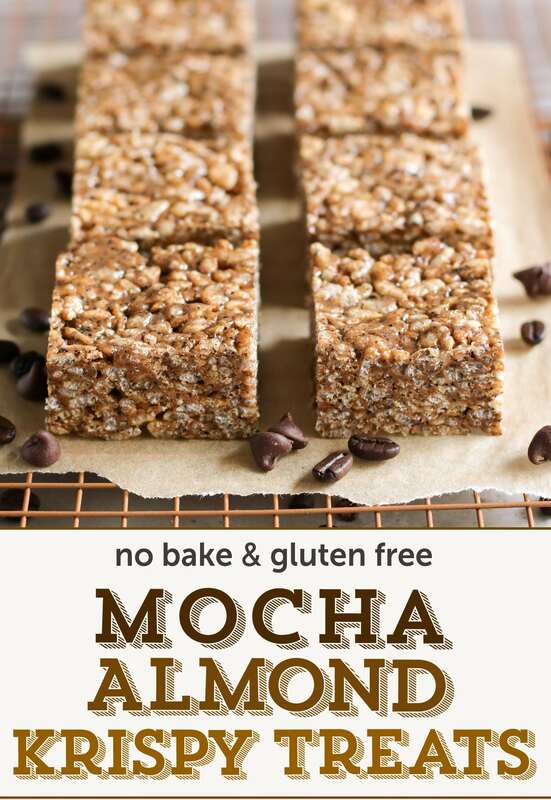 Made with gluten free crispy brown rice cereal, almond butter, a chocolate drizzle, and a hit of protein too! In a large mixing bowl, add the crispy rice cereal, oats, flaxseed, and salt. 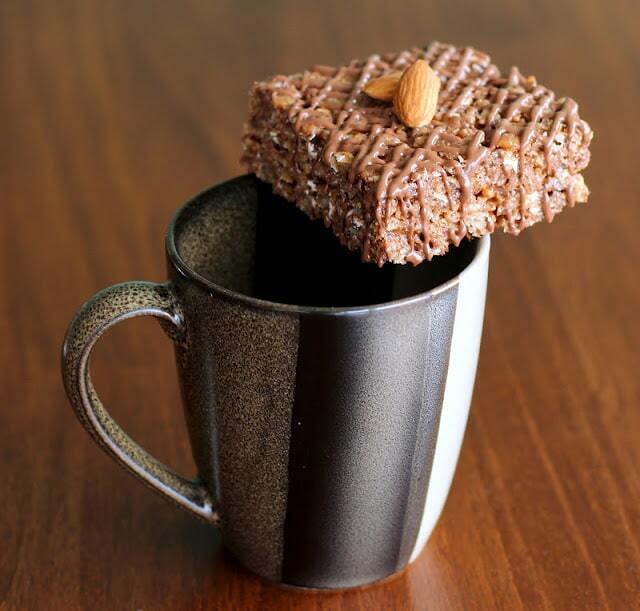 In a large, microwave-safe bowl, stir together the brown rice syrup, almond butter, and extracts. Microwave at 20-second intervals, stirring between each one, until warm and runny. Stir in the protein powder and instant coffee one spoonful at a time. Dump in the rice cereal mix and fold together. Scoop mixture into prepared pan and flatten it out. Refrigerate for 2 hours, then slice. Feel free to serve with a drizzle of melted No-Sugar-Added Milk Chocolate! Serve and enjoy! As a normal human being, I have a profound addiction taste for chocolate, and all things chocolate. TELL ME: What was your first coffee experience like? Did you like it right off the bat or did it take some getting used to? Wow. This looks absolutely delicious! I just bought some rice cereal, and wanted to make something with it. This is perfect! I have every single ingredient on hand. I’m totally making these over the weekend. I really wasn’t expecting the recipe to be vegan before clicking through from Foodgawker. What a nice surprise. 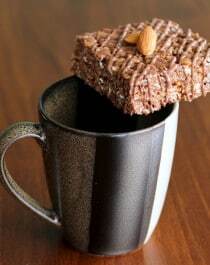 OMG I miss Coffee Crisps!!! Used to get them every Christmas from my aunt who comes down (to FL) from Canada for the winter. Do they still sell them in Canada? I will have to try these just so I can re-live my favorite treat. Thank you! Hope you like the krispy treats! I have taken photos of what i made and posted it on my blog. It’s my first blog entry and I’m kind of new to blogging and stuff.